The flathead catfish (Pylodictis olivaris), also called the mudcat, flatty, or shovelhead cat, is a large species of North American freshwater catfish. It is the only species of the genus Pylodictis. Ranging from the lower Great Lakes region to northern Mexico, they have been widely introduced and are an invasive species in some areas. 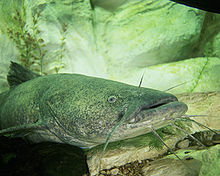 The closest living relative of the flathead is the widemouth blindcat, Satan eurystomus. Flatheads grow to a length of 155 cm (61 in) and may weigh up to 56 kg (123 lb), making it the second-largest North American catfish (after the blue catfish, Ictalurus furcatus). The average length is about 25-46 in (64-117 cm). Their maximum recorded lifespan is 24 years. Males are mature from 16 cm (6.3 in) and 4 years of age, while females mature from 18 cm (7.1 in) and 5 years of age, but may mature as late as 10 years. The world angling record flathead catfish was caught May 14, 1998, from Elk City Reservoir, Kansas, and weighed 123 lb 9 oz (56.0 kg),However a record from 1982 show’s that the flathead catfish would be North Americas longest species of catfish, after a specimen pulled from the Arkansas river that measured 175 cm (69 in.) and weighed 63.45 kg(139 lbs and 14oz.). Flatheads prefer live prey. They are voracious carnivores and feed primarily on other fish, insects, annelid worms, and crustaceans. Spawning occurs in late June and early July, and the nests made in areas with submerged logs and other debris. The males, which also build the nests, fiercely and tirelessly defend and fan the clutch. The size of the clutch varies proportionately to the size of the female; an average of 2,640 eggs per kilogram of fish are laid. The fry frequent shallow areas with rocky and sandy substrates, where they feed on insects and worms such as annelids and polychaetes. Young flatheads are also cannibalistic, which has largely precluded their presence in aquaculture. Inhabiting deep pools, lakes, and large, slow-moving rivers, flathead catfish are popular among anglers; their flesh is widely regarded as the tastiest of the catfishes. Their size also make the flatheads effective subjects of public aquaria. These 35- to 40-lb flathead catfish were caught in the Susquehanna Riverin late June 2015 on live bluegills. Sport fishing for flathead catfish using either rod and reel, limb lines, or bare hands (noodling) can be an exciting pastime. Anglers target this species in a variety of waterways, including small rivers (barely large enough for a canoe), large rivers (such as the Missouri, Mississippi, Ohio, and Colorado Rivers), and reservoirs. A common element of flathead catfish location is submerged wood cover such as logs and rootwads which often collect at bends in rivers. A good flathead spot usually also includes relatively deep water compared to the rest of a particular section of river, a moderate amount of current, and access to plentiful baitfish such as river herring, shad, carp, drum, panfish, or suckers. Anglers targeting large flathead catfish usually use stout tackle such as medium-heavy or heavy action rods from 6–10 ft (1.8–3.0 m) in length with large line-capacity reels and line ranging from 20–80 pounds-force (89–356 N) test breaking strength. Generally large live baits are preferred such as river herring, shad, sunfish (such as bluegill), suckers, carp, goldfish, drum, and bullheads ranging from 5–12 in (13–30 cm) in length.